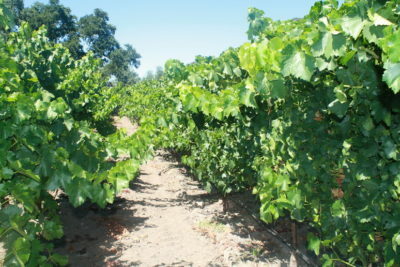 Hunters Oak Vineyard was established in the Clements Hills AVA of Lodi in the summer of 2006. Within this beautiful twenty acre tract of land, thirteen acres have been dedicated to the production of ultra premium wine grapes for some of the regions finest winemakers. The Clemen ts Hills AVA is well known for it’s hot summer days and cool evening breezes. Hunters Oak rests in the heart of the Mokelumne River basin and is bordered by Bear Creek thus providing the perfect terroir for our Spanish and French varietal wine grapes. The vineyard is sustainably farmed and is certified under the Lodi Rules for Sustainable Winegrowing program. Additionally, the vineyard is self sustained with all of it’s water and electrical requirements being met onsite. The areas surrounding the vineyard provide a natural setting for many of the regions birds, fish, and wildlife, as well as the Halecky’s family residence. A majestic 250 year old Valley Oak, the “Hunter’s Oak”, stands on the property as a monument and tribute to the Miwok Indians who once lived throughout the area.